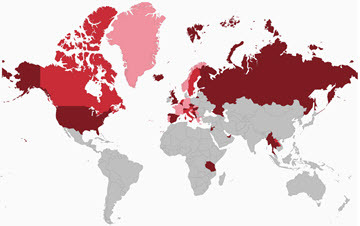 Use the map to select our recommendations by area and book on our Booking.com partner website. Our short reviews of each of the places we feel are the best places to stay in Iceland are each below grouped by region or use the links below to jump to a region. Reykjavik is Iceland’s capital and 60% of the entire population of Iceland calls the city home. If incorporating a bit of nightlife and city life in to your Iceland itinerary is important, than Reykjavik is where it’s at. Reykjavik is a top spot to ring in the New Year, attend various events like Iceland Airwaves and serves as a departure point for the majority of tours. Reykjavik is also an excellent base for exploring the city, Reykjanes Peninsula, Golden Circle and even as far as the South Coast. Particularly if you’re not traveling independently around Iceland, you’ll want to base yourself out of Reykjavik since most Iceland tours pick up from Reykjavik hotels and depart from the capital. Reykjavik is also a great choice for a base when considering where to stay in Iceland in winter since many more remote accommodations aren’t open during the slower winter months. Because of the access to so many tour options, restaurants, nightlife, services and shopping, Reykjavik is arguably the best place to stay in Iceland, particularly if you’re only visiting on a short trip like an Icelandair stopover. When it comes to where to stay in Reykjavik, hotels tend to be more expensive than anywhere else in Iceland. We’ve stayed twice now in a lovely apartment, Túngata 32 (read the TripAdvisor reviews), which is an excellent Reykaviak hotel alternative. The apartment is in a great location just a few minutes walk to the harbor and city center and has free parking available on the street. 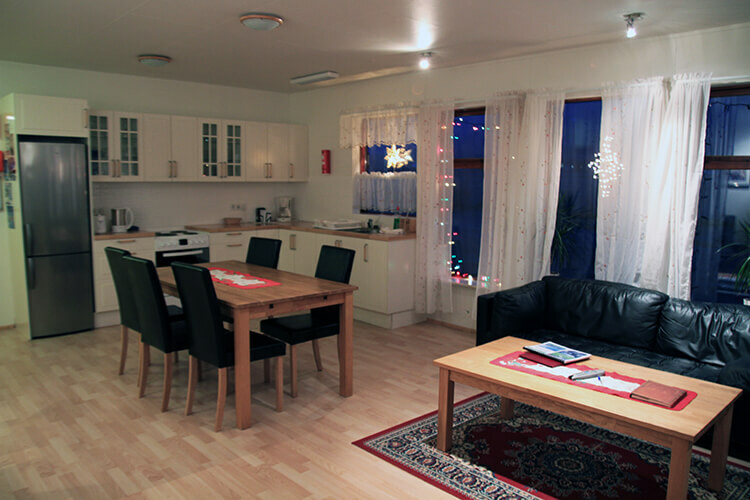 You can save money by using the fully equipped kitchen to make breakfast before heading out day (it’s especially important to have a good breakfast before a day of adventure activities in Iceland) or even a few lunches or dinners. It also has speedy and free wifi. 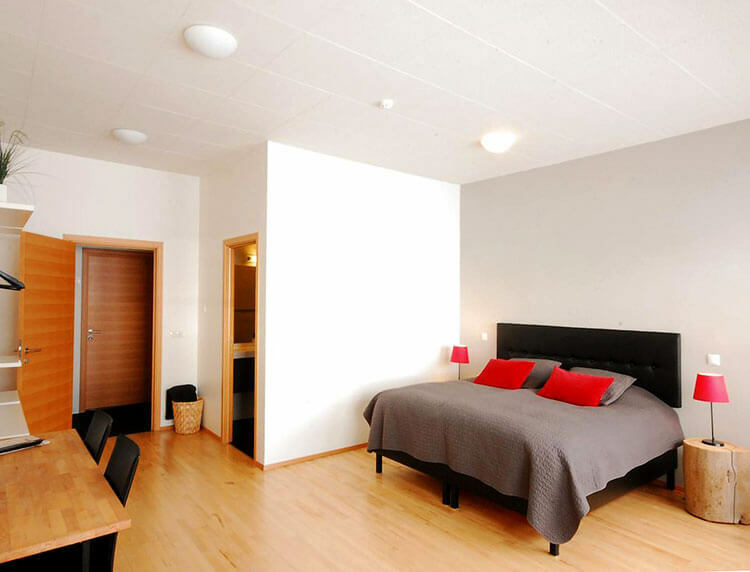 With prices around $100 per night (there is a two night minimum), Túngata 32 is an affordable option for accommodation in Reykjavik city center. For travelers who like the hotel experience or if Túngata 32 is booked, Hilton Reykjavik Nordica (read the TripAdvisor reviews) is an excellent choice and it’s one of the best hotels in Reykjavik. The hotel isn’t located right downtown, but it does offer bicycle rental and there is a bus stop directly in front of the hotel. Bed and breakfast rates are available and wifi and parking are always complimentary. Hilton also offers services such as babysitting for families that want to do activities like glacier trekking that aren’t kid friendly. Rates from $160 per night. Hotel Borg (read the TripAdvisor reviews) is a landmark in Reykjavik. 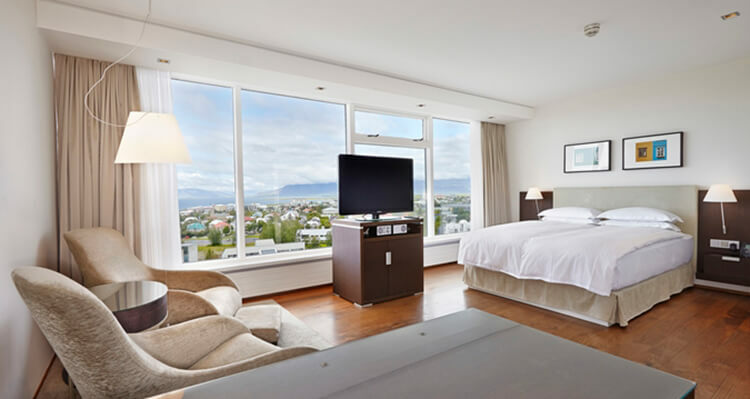 One of the best hotels in Reykjavik city center and the first ever luxury hotel in Iceland, Hotel Borg overlooks the Austurvöllur square and is directly across from the Althingi. Restaurants, bars, shopping and Reykjavik’s attractions radiate out in all directions from the historic hotel. Some of its esteemed neighbors are the Hallgrímskirkja church and Harpa concert hall. The hotel was renovated in 2015 with 43 rooms added to give it a total of 99 rooms and suites. The decor matches the Art Deco architecture and all the rooms have been fitted with custom made furnishings. Black and white photos of a 1920s Reykjavik decorate the walls and its easy to image the days gone by in Iceland’s capital. The bathrooms have heated floors, which is always a favorite feature of ours – especially if you’re traveling in Iceland in winter. A spa annex was added during the latest renovation and is equipped with a steam bath, sauna, treatment rooms and a gym. Another hotel in Reykjavik center that we recommend is Canopy by Hilton Reykjavik City Centre (read the TripAdvisor reviews). 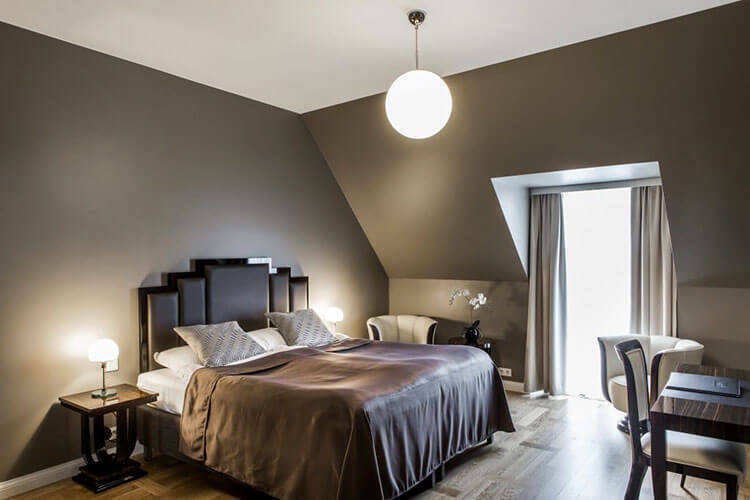 As the name implies, the hotel is located just 50 meters off of Laugavegur, the shopping street that runs right through the heart of Reykjavik. The Harpa Concert Hall is just a 5-minute walk away and restaurants, cafes and nightlife are practically on your doorstep. 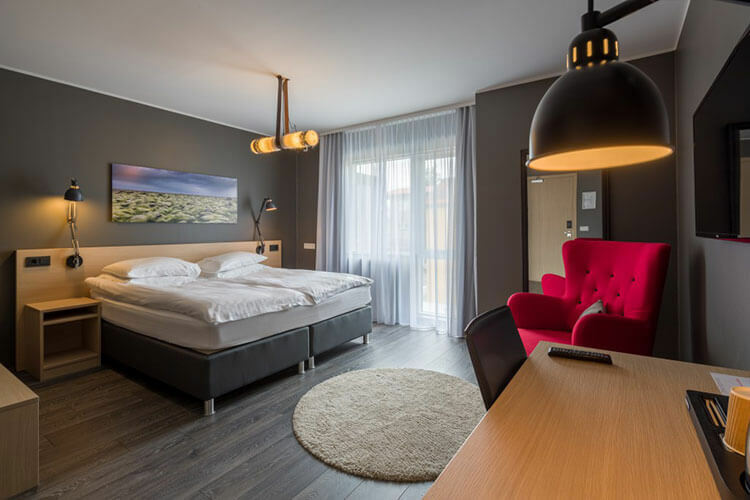 The hotel is housed in six connected historic houses and though Hilton is a globally known chain, loads of local Icelandic touches are incorporated into the hotel’s design and artworks by local artists adorn the walls. You’re welcomed with a local treat at check-in and the hotel provides complimentary bicycles for guests to get easily get around town. Aside from the extra comfy Canopy bed with gel memory foam and Serta Cool Balance® Technology, the rooms are all equipped with a mini fridge so you can stock some snacks and drinks and a Nespresso machine. Wifi and breakfast are complimentary. Plus, there’s lots of little extras like included evening tastings in their Canopy Central coffee shop and other surprises. Alda Hotel (read the TripAdvisor reviews) is located in a funky modern building right in the center of Laugavegur, the shopping street. Shopping, attractions, cafes and restaurants surround the centrally located hotel. 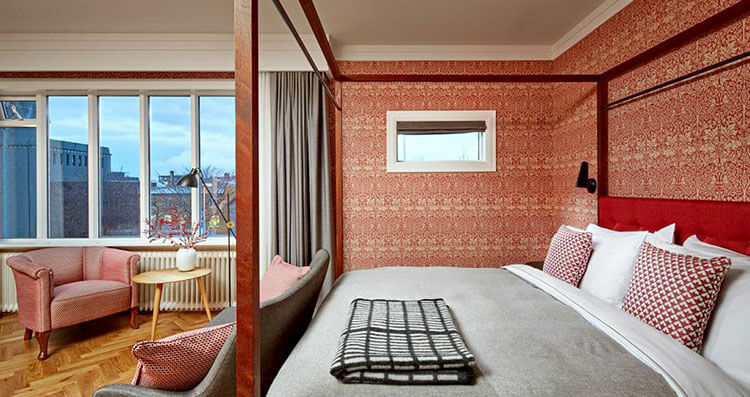 It’s one of the top hotels in Reykjavik and perfect for couples looking for a romantic stay. The rooms range from singles to suites, all with a luxurious atmosphere and gorgeous pops of red. All rooms have private bathrooms and some rooms have either a balcony or sea views. Guests have free access to Alda Hotel’s fitness center and sauna, plus amenities like in-room massages can be booked by the hotel. The hotel also has bicycle rental available for guests. And there’s an onsite bar to relax at in the cool atmosphere. Iceland’s Golden Circle is the circular route near Reykjavik that encompasses some of Iceland’s most famous sights. It’s 190 miles (300 kilometers) long and technically you can hit all of the attractions on a Golden Circle day trip from Reykjavik. But it’s worth staying along the Golden Circle to beat the crowds and tour buses. Plus, if you’re traveling during the Northern Lights season from September through April, the Golden Circle is away from the light pollution of Reykjavik and makes for better Northern Lights hunting. One of the most unique places to stay in Iceland is also found along the Golden Circle. The Golden Circle is one of the best areas to stay in Iceland – particularly if you’re visiting Iceland for 5 days or less, yet still want to get out in the Icelandic nature. 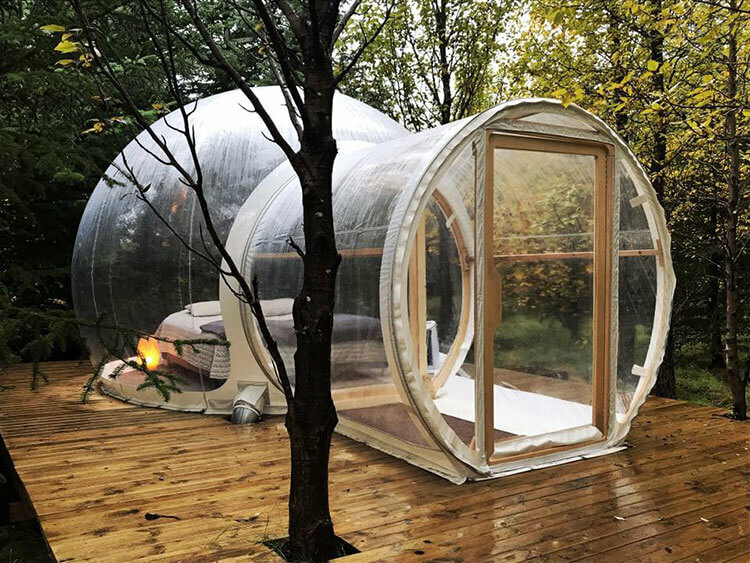 Buubble: The 5 Million Star Hotel (read the TripAdvisor reviews) is a unique glamping experience in the forest of a farm near Reyholt. There are five bubbles total and they can only be booked as part of a Golden Circle tour and overnight bubble experience offered directly by the creators behind Buubble. The bubbles are heated, so they are comfortable to stay in any time of the year. There is a shared house nearby with two full bathrooms and a kitchenette for guest use. You need to bring your own food, towels and toiletries but spending the night under a sky full of stars or possibly even the Northern Lights, is memorable experience and one of the most unusual places to stay in Iceland. 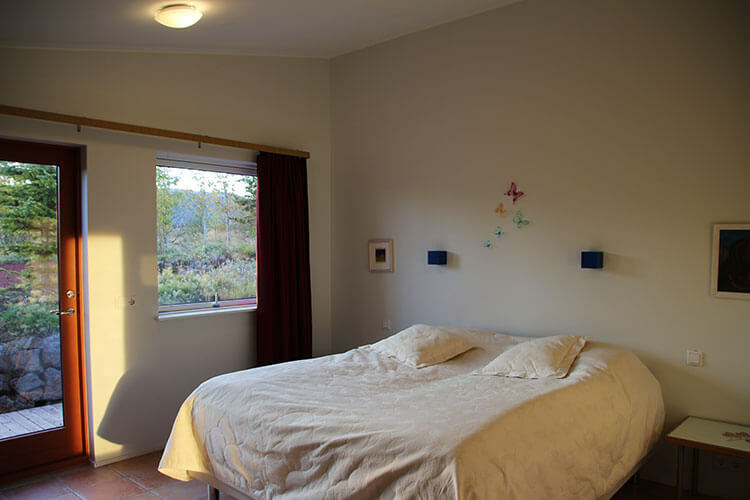 Located on the edge of the 5000 year old Grímsneshraun lava field, Iceblue Lodge B&B is a family run bed and breakfast on the property where the family lives. It has seven rooms: three which share a bathroom and four rooms with their own private bathroom and deck. 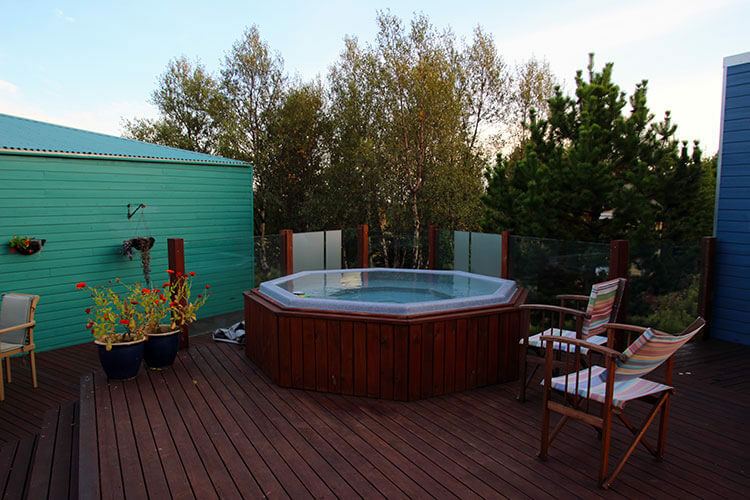 There’s also a hot tub and a sauna for guests to use, as well as natural hot springs located nearby. 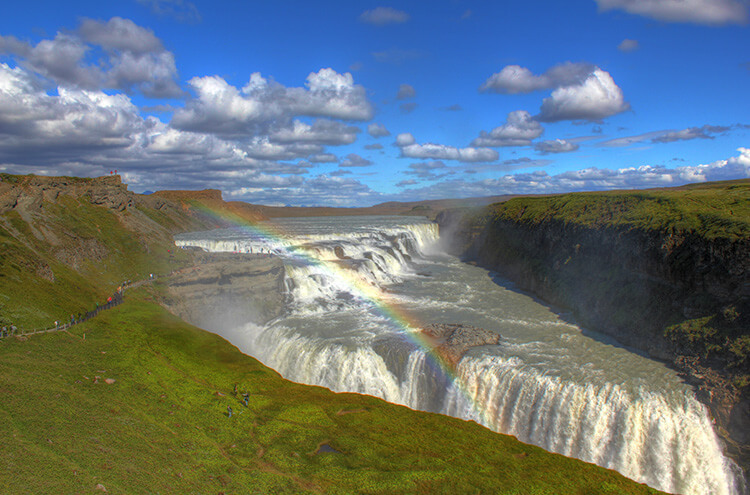 Iceblue Lodge B&B is close to the sites of the Golden Circle like Gullfoss and Geysir, making it a great choice for exploring some of Iceland’s most popular attractions. There is absolutely no light pollution, so your deck or right from the jacuzzi are excellent spots to watch for the Northern Lights. The B&B does not have a restaurant, but it’s located just a 20 minute drive from Selfoss, which is the biggest city in South Iceland and has a number of restaurant options. 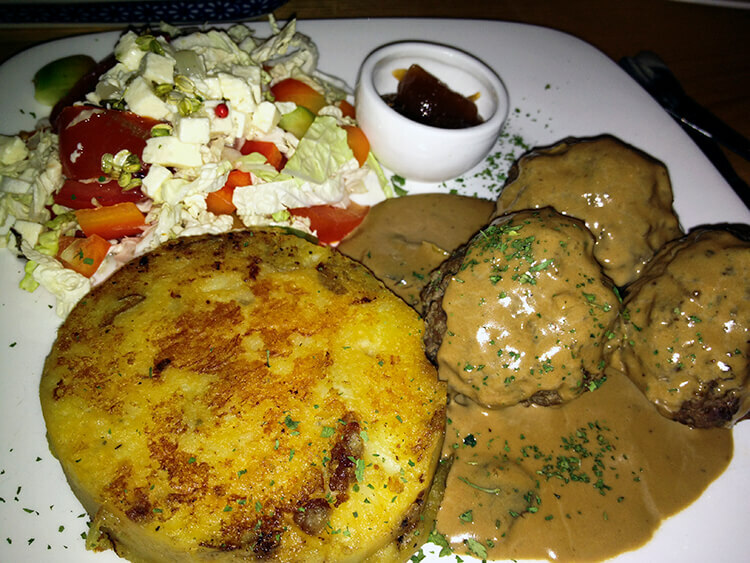 Reykholt is also just a 20 minute drive and we recommend Restaurant Mika. Family-run, the restaurant offers a selection of Icelandic dishes and sources from local farms. Try the deep fried coconut panko crusted Icelandic langoustines, lobster soup or the lamb. Iceblue Lodge does offer super jeep tours, including a Golden Circle and a Northern Lights tour. They also offer packages that include airport pick-up, two nights with breakfast and two super jeep tours. Note the Iceblue Lodge does close for the winter season from October. 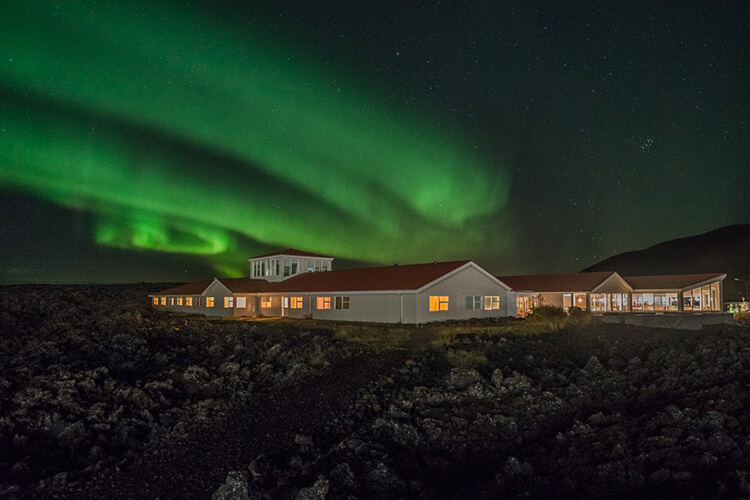 Set among the mountains and lava fields on the Golden Circle route and close to Thingvellir National Park, Ion Adventure Hotel is a luxury option and a popular choice for Northern Lights viewing less than an hour outside of Reyjavik. 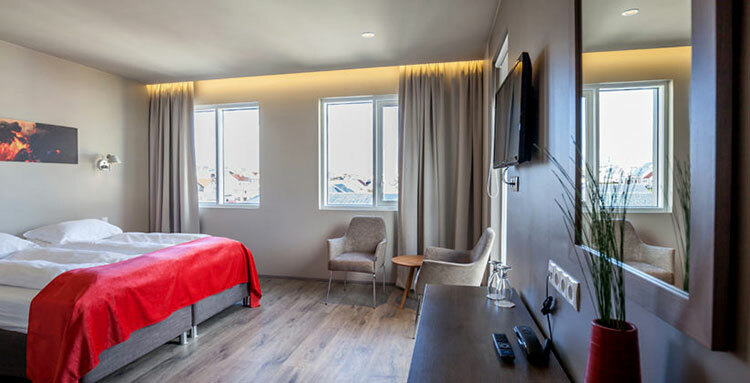 The rooms all boast floor to ceiling windows giving guests a view of either the lava field or the geothermal power plant and have a contemporary Scandinavian design. The hotel does have a spa and a gourmet restaurant onsite, and offers free wifi to guests. For rates from $300 per night, not including breakfast, we do except a friendlier staff and better service though. Note that TripAdvisor reviewers regularly also note the poor service and pretentious attitude of the staff at the hotel. The South Coast is one of the most spectacularly beautiful parts of Iceland. There’s countless waterfalls pouring over towering cliffs as you travel along Route 1, or Iceland’s Ring Road. The basalt lava stacks and black sand beaches make for the perfect backdrop for photos. The DC3 plane crash on a remote black sand beach is an almost eerie sight that seems like something straight out of a movie. And no trip to Iceland is complete without visiting Jökulsárlón, the glacier lagoon full of blue icebergs. While ambitious travelers to Iceland often make day trips from Reykjavik all the way to Jökulsárlón and back in a day (we also did it once when Tim was living in Iceland), it does take about 5 hours to drive each way without factoring in the countless stops you’ll want to make. You can more easily day trip the South Coast from Reykjavik during the summer when Iceland experiences long days and the Midnight Sun. If you’re traveling in winter, it’s not even possible to make the drive one way as days are short with as little as 5 hours of daylight in December and January. There’s just so many sights on Iceland’s South Coast that it’s really best to stay somewhere along Route 1. 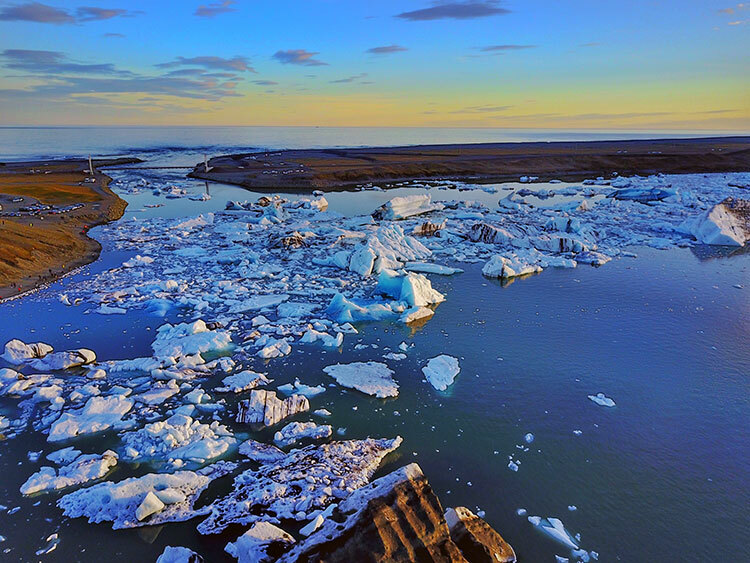 Breaking up your trip with at least a 1-night stay affords you the luxury to take your time exploring this beautiful stretch of Icelandic coast. Hotel Ranga (read the TripAdvisor reviews) is the only 4-star hotel outside of Reykjavik, the best hotel in Iceland and an excellent base for exploring all the treasures of Iceland’s South Coast. The log-built hotel feels more like you’re staying in a friend’s amazing home than in a hotel. Set just off of Route 1 not far from the famous Seljalandsfoss waterfall, the hotel is away from any light pollution and has a Northern Lights watch nightly. Simply let the front desk know if you’d like a call – they’ll even track you down in the restaurant or outdoor hot tubs to make sure you experience the Aurora Borealis. Because of their constant watch, it’s one of the best places to stay in Iceland for Northern Lights. Rates from $250 per night. The Volcano Hotel is a modern bed and breakfast with just 7 rooms located between Mýrdalsjökull glacier and the black sand beaches of Vik. 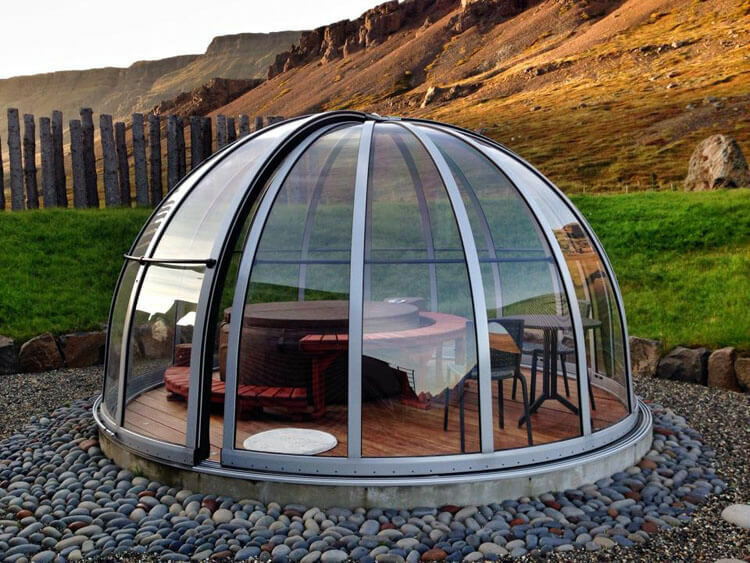 The Volcano Hotel and is a great option to spend the night after glacier hiking on Sólheimajökull. The hotel rooms are simple, yet modern and comfortable. Wifi and breakfast is included. There isn’t an onsite restaurant in the hotel, but there are at least three restaurant options with 10 kilometers of the boutique hotel. 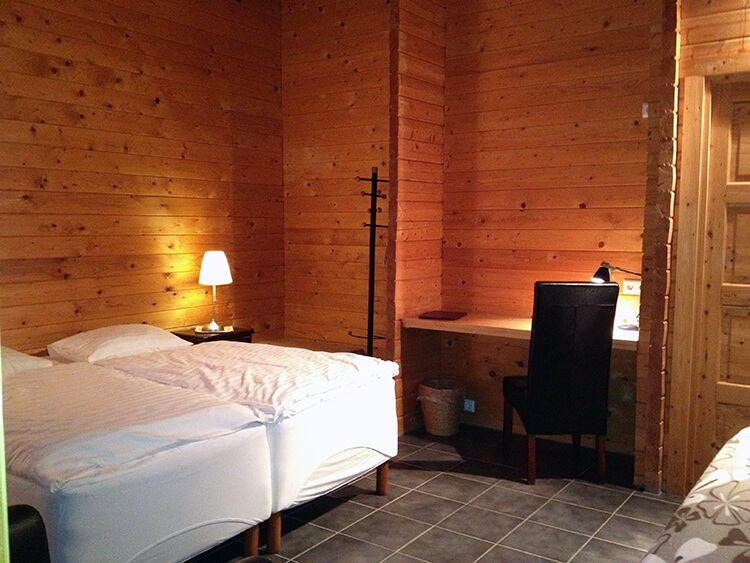 In winter a private double room with bathroom and breakfast is around $130 per night. Fosshotel is a new chain of four star hotels that have popped up around Iceland. One of their locations is just a 20-minute drive west of Jökulsárlón Glacier Lagoon, so we decided to check them out. Fosshotel Glacier Lagoon (read the TripAdvisor reviews) is conveniently located on Route 1 between Skaftafell National Park and Jökulsárlón. The hotel has 104 rooms, free parking, free wifi, breakfast included in the room rate and an onsite restaurant. As you might imagine with such a large number of rooms, the hotel is incredibly popular with accommodating the multi-day bus tours. We were one of just a few independent travelers staying at the hotel, but even so that architecture makes it one of the cool places to stay in Iceland. There are three rooms categories and we stayed in a deluxe room, which have bay windows and a window perfectly placed in the slanted wall for keeping watch for the Northern Lights right from the bed. 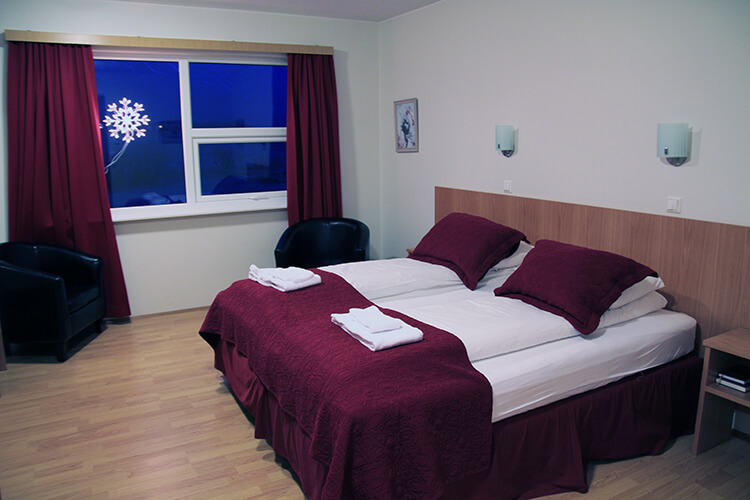 All the rooms are decorated in a contemporary Icelandic style. Icelandic breakfast is one of our favorite parts of staying in guest houses in Iceland, and Fosshotel’s was disappointing. The breakfast definitely caters to tourists with a typical buffet of scrambled eggs, bacon, pastries and the other assorted items you’ll find almost anywhere in the world. 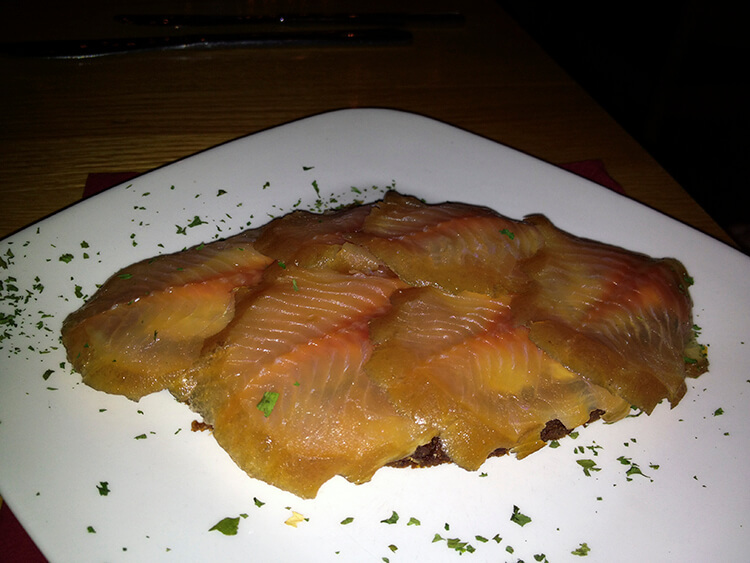 It was lacking Icelandic staples like skyr and Arctic char. It was also disappointing that the breakfast had to have large signs in several places reminding guests that the breakfast items are not meant for them to pack a bagged lunch with. We also had dinner at the restaurant. 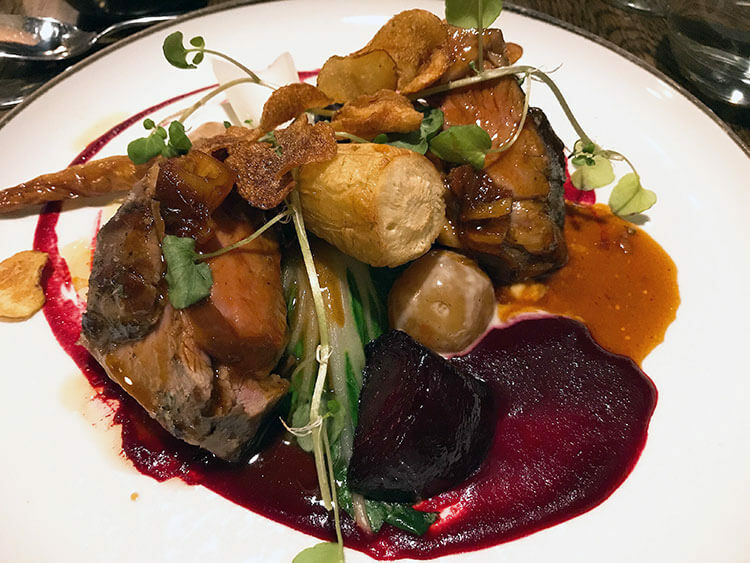 While the menu has a variety of Icelandic dishes, we found the prices to be quite high and the food just not as good as that served at farm stays and guest houses. That said, Fosshotel Glacier Lagoon is situated in a little pocket with its own microclimate. The Northern Lights came out almost immediately after dark and continued to dance for the next six straight hours before we finally just had to go to bed. After watching them for about 20 minutes from the hotel, we hopped in the car and headed for Jökulsárlón. Unfortunately, it was 100% cloudy there and after waiting for two hours to see if the sky would clear, we gave up and headed back to Fosshotel. Back at the hotel, the Northern Lights were still going strong. The hotel does offer a Northern Lights wake-up call to guests that request it – just sign up at the front desk. We picked the Hali Country Hotel (read the TripAdvisor reviews) because of its location just 12 kilometers from Jokulsarlon Glacier Lagoon. We were hoping for a clear night and to see the Northern Lights dance over the icebergs dotting the lagoon. While a winter storm came in just after our arrival, we had a lovely stay on the family run farm. Þorbjörg and Fjölnir, the proprietors of the hotel, were fantastic hosts kindly showing us around the lovely on-site museum and regularly checking road conditions for our drive up north. Hali Country Hotel offers a variety of room types from private rooms with bathrooms, to private rooms with shared bathrooms, and dorm-style sleeping bag accommodations. The building also has a lovely common room with a fully equipped kitchen for the option of making meals in. In winter, a double room with private bathroom and breakfast is around $135 per night. We enjoyed dinner at the restaurant, which serves arctic char (a cold-water fish) freshly caught from the farm’s pond and lamb also from their farm. We tried the smoked arctic char as an appetizer, Tim had lamb, and I had a combo that included steamed arctic char, Icelandic lobster tails (also fished from the farm), and salted cod. Everything was delicious! East Iceland is the most secluded area when traveling Iceland’s Ring Road. 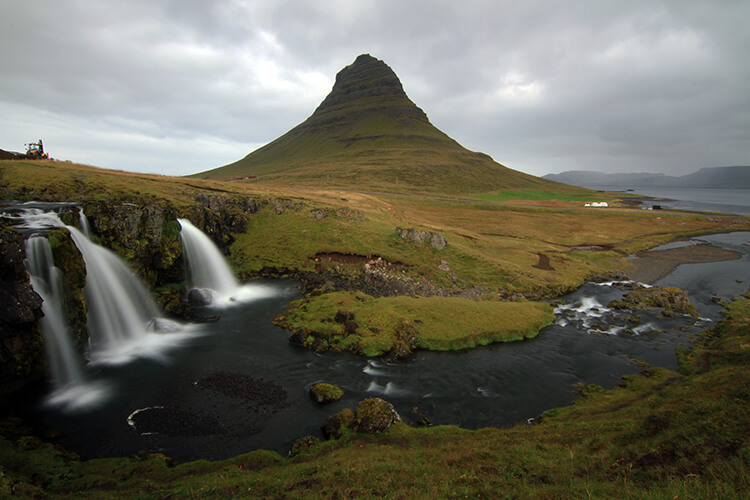 Shaped by the glaciers during the Ice Age, the East Fjords are among the oldest regions of Iceland. Though this part of Iceland is mostly uninhabited, there are some beautiful hiking trails and you can even find golf courses in this part of Iceland. Like trying to travel from Reykjavik to Jökulsárlón in a day, the drive from Jökulsárlón to North Iceland seems even longer as you make your way around one fjord after another. It’s definitely worth spending a night in the East Fjords and exploring some of the attractions here, not to mention you might be lucky enough to spot Iceland’s reindeer population that is only found in this part of the country. Silfurberg is a luxury farm stay in the East Fjords. The lovely Guðrún and Jón purchased the farm in 2003 and completely remodeled the barn into a luxurious hotel. There’s even an incredible outdoor hot tub where you can look at the stars. The town of Breiddalur isn’t far from the farm, but you can also book a delicious home cooked dinner that Guðrún and Jón will prepare. In September, you can also take part in their annual sheep round up. If you’re headed around the Ring Road, Silfurberg is definitely one of the top places to stay in Iceland. Breakfast is included. 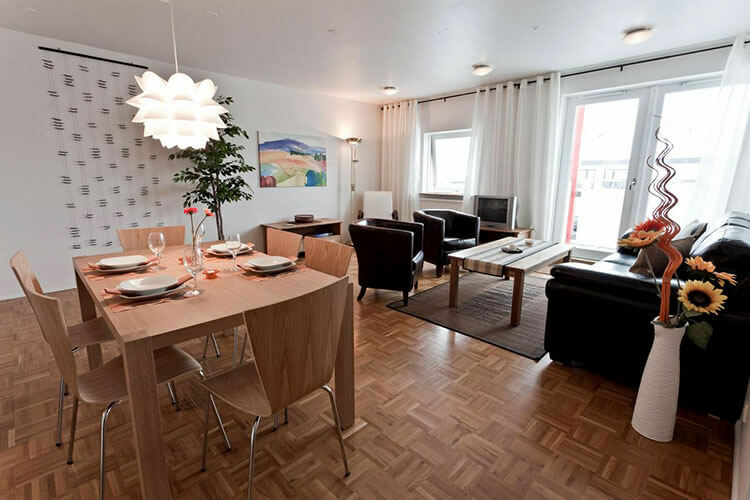 Located in Iceland’s easternmost fjord, Neskaupstadur, Hildibrand Apartment Hotel has both guest rooms in the main building and fully equipped apartments that are great for families or those that like to eat a few meals in when traveling. The apartments have private balconies with panoramic views looking out on the fjord and all guests have free access to the geothermal swimming pool complex in the town. The hotels also has the Co-Op Bar, which is known for its fresh seafood and sushi. 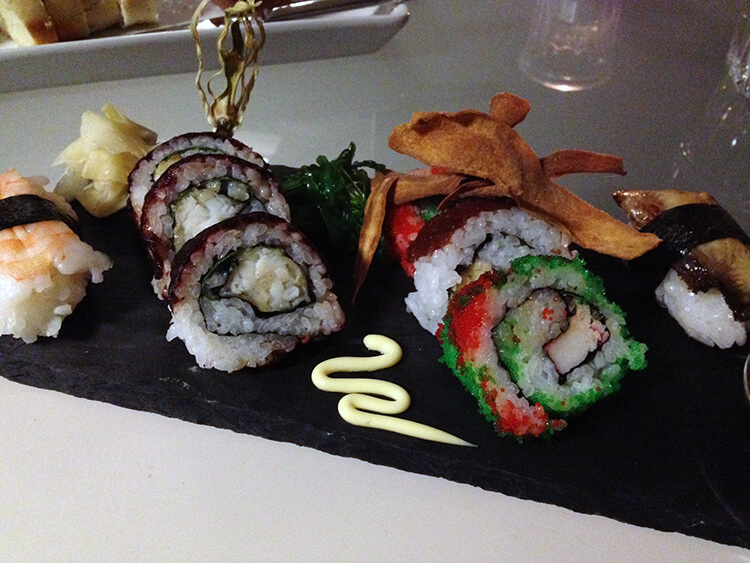 We tried the sushi and were quite impressed with the variety offered. There’s some great hiking in the area and we always had some wonderful Northern Lights viewing in Neskaupstadur. And while you might not think about golfing on your Icelandic holiday, Nordfjardarvöllur Golf Course, one of Iceland’s few golf courses is just a few miles away from the hotel. Just about on the edge of the Arctic Circle, North Iceland is home to natural jewels like Europe’s most powerful waterfall and Iceland’s best whale watching. Myvatn is famous for its natural beauty and you’ll find the lesser visited and natural hot water pools of the Myvatn Nature Baths. A few days is not enough to see all the North Iceland has to offer, but we recommend spending at least 3-4 days exploring. Akureyri is the capital of North Iceland and like a smaller scale Reykjavik with shops, museums, restaurants and cafes. When staying in North Iceland, we personally prefer Myvatn for its natural beauty and Northern Lights watching opportunities in the fall and winter months. Tours often depart out of either Akureyri or Myvatn, so either is a good choice for a base for where to stay in North Iceland. The weather is also more stable in North Iceland, making it one of the best places to stay in Iceland in winter. You’ll encounter less of the erratically changing weather and wind that the south has, often the best chances for seeing the Northern Lights, and far fewer tourists. It’s said that there is a 50% better chance to see the Northern Lights in the north of Iceland. The weather is more stable than in the south and it’s just a little bit closer to the middle of the Aurora belt. So we chose to spend 3 nights at Vogafjós Guesthouse (read the TripAdvisor reviews), in the small Mývatn community of just 400 people. And what a fantastic choice it was. In fact, we loved our first stay there so much, we’ve returned to Vogafjós Guesthouse more than once and think it’s one of the top hotels in Iceland. Vogafjós Guesthouse is another family owned and run farm and we loved the simple, yet comfy and cozy log cabin that was our home for 3 nights. Who wouldn’t enjoy heated floors in Iceland in winter? And that we could literally look for Northern Lights by opening up our front door made our regular lookouts a bit easier. Our hourly alarms paid off on our second night with a spectacular, albeit short, show. In winter, a double room with private bathroom and breakfast is around $120 per night. Vogafjós also has a restaurant called the Vogafjós Cowshed Cafe. The lovely log cabin style restaurant has glass windows that look into the cowshed where the farm’s cows reside in winter. It became our twice-daily ritual to greet the cows before breakfast and dinner and we’ve been commenting that we miss the cows ever since! Dinner was a delicious affair each day and we nearly tried everything on the menu over our three days at Vogafjós. Homemade geyser bread, which is baked in a communal “stove” in the ground, accompanied every meal. And oh, is it delicious! The best is geyser bread slathered with a butter and topped with smoked arctic char, which we had for breakfast and dinner daily. If you’re lucky, you might also get to try the moss bread which is made from moss gathered around the farm. We also thoroughly enjoyed the goulash soup, steamed arctic char, and meatballs with homemade rhubarb jam. Try the trio of homemade ice creams for dessert. When you arrive in Iceland, you’re almost sure to arrive at Keflavik International Airport. The airport is actually located on the Reykjanes Peninsula, about a 1-hour drive from Reykjavik, and is the best area to stay in Iceland just after arriving or just before departing. Typically international flights from the US arrive in the evening hours. Aside from the fact that you really want to examine your rental car in the daylight to give it a good once (or twice) over to assess any prior damage, there’s actually quite a bit to see around the Reykjanes Peninsula. We recommend just heading to one of the nearby hotels and getting a good night’s sleep instead of making a long drive in the dark after a long day of travel. Or if you’re leaving on an early flight, it’s really best just to stay near the airport. 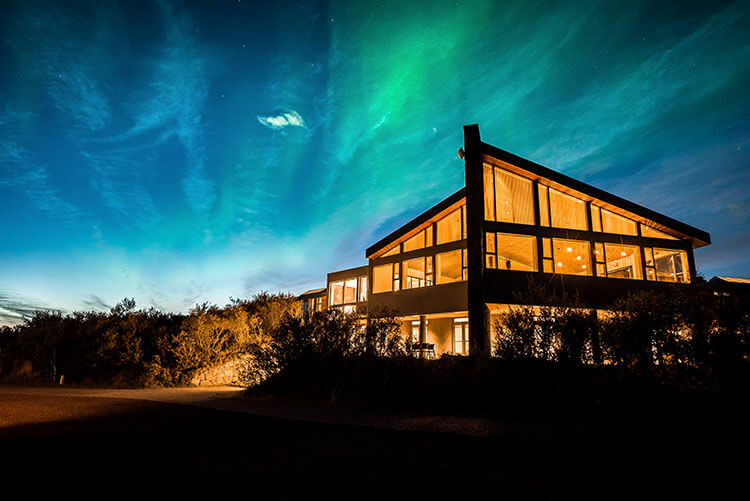 There’s some really fantastic hotels on the Reykjanes Peninsula and this is an excellent area for spotting the Northern Lights during the Aurora season. We actually stayed at Hotel Berg (read the TripAdvisor reviews), which is conveniently located just 10 minutes from the airport, just after it first opened in 2011. The modern rooms are comfortable and I love the huge window that looks out over a lovely harbor in the breakfast room. We were pleased to find on our return that Hotel Berg had expanded and had a whole new reception and larger breakfast area. And its’ proprietors couldn’t be more kind. It’s our go-to hotel and one of the best boutique hotels in Iceland. We’ve stayed at Hotel Berg a total of four different times now. 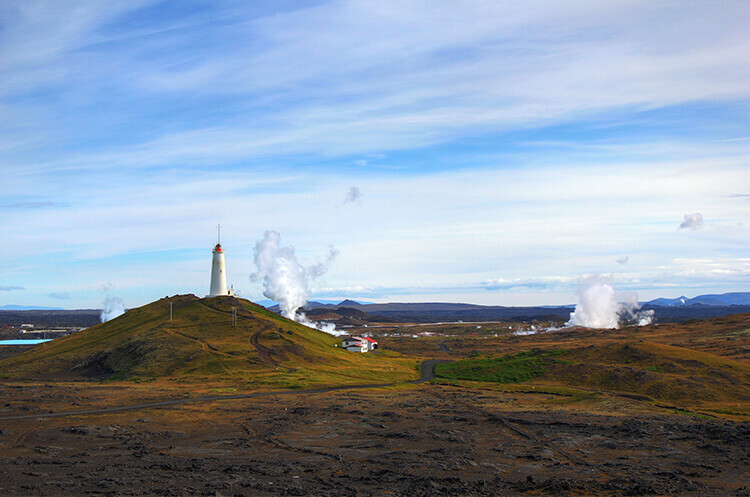 Hotel Berg is a fantastic base for exploring the lighthouses, black sand beaches, and steaming fumaroles of the Reykjanes Peninsula and is just a 20 minute drive to one of Iceland’s biggest attractions, the Blue Lagoon. And they send you out for the day with an ample breakfast including batter for homemade do-it-yourself waffles and all the toppings. Breakfast even starts at 4am for those of us unlucky to have a very early flight out. If staying at Hotel Berg from September to March, request a Northern Lights wake-up call at reception. They have a friend that is an Aurora hunter around the Reykjanes Peninsula and will call the hotel when he spots them. A double room with private bathroom and breakfast is around $110 per night. 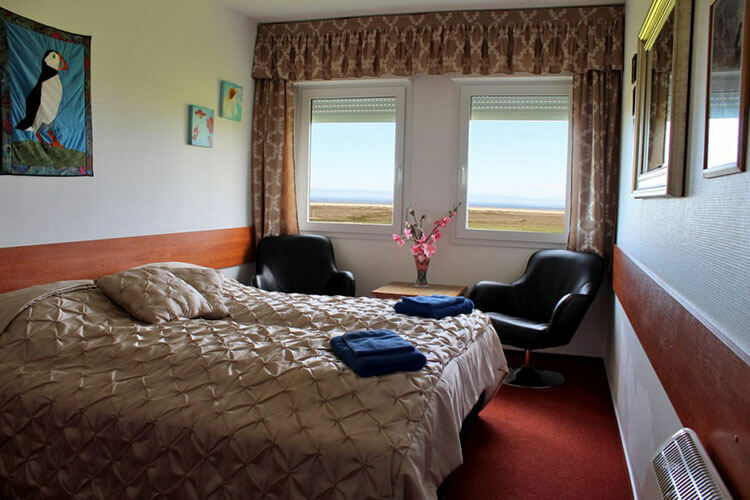 Just a 1-minute drive to the famous Blue Lagoon and 20-minutes from Keflavik Airport, the Northern Light Inn (read the TripAdvisor reviews) is another great choice when arriving late or leaving early on flights. It’s also close enough to Reykjavik to enjoy the capital city, yet far enough away from the city light pollution if you’re interested in Northern Lights viewing. 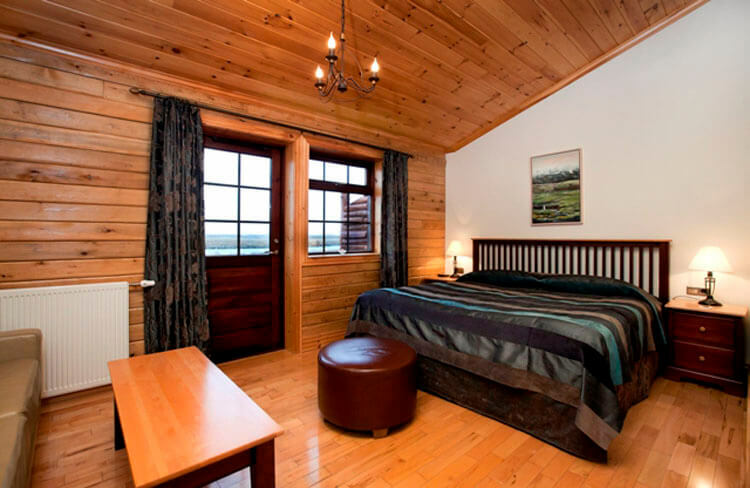 We love the comfortable rooms with views of the moss covered lava field that the hotel is situated in. There’s also a gorgeous common room with fireplace, perfect for relaxing with a cup of tea after a busy day exploring the Reykjanes Peninsula. Breakfast is included, with a buffet offering of breads, skyr, smoked salmon and other typical Icelandic breakfast items. 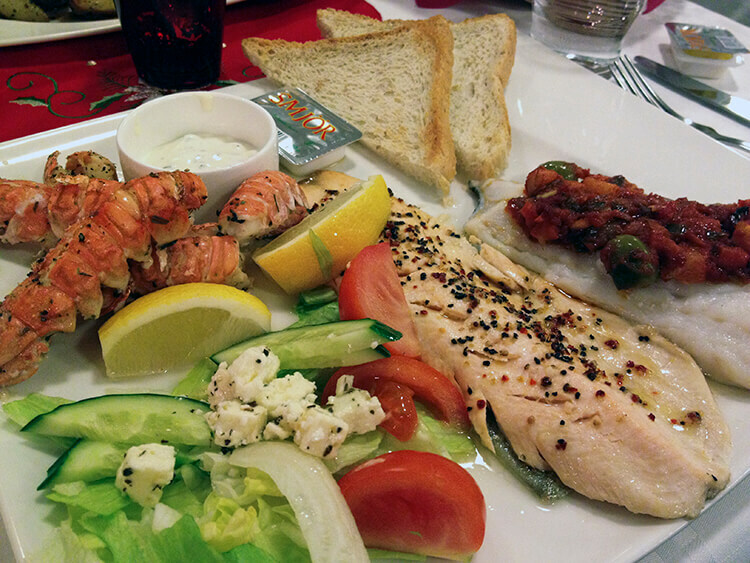 Max’s Restaurant is also an excellent choice for dinner and serves Icelandic specialties like fresh fish, lamb and home baked breads and cakes. Most visitors to Iceland that make it to the Westman Islands only go as a day trip. Once you’re there, we guarantee that you’ll wish you had stayed longer. During the summer months puffins and other nesting sea birds love to make the Westman Islands their home. There’s things to do like hiking the infamous volcano that erupted and covered most of it like a modern day Pompeii, golfers will love the 18-hole golf course that is considered one of the most unique in the world and you won’t want to miss a rib boat ride around one of the newest islands on the planet. 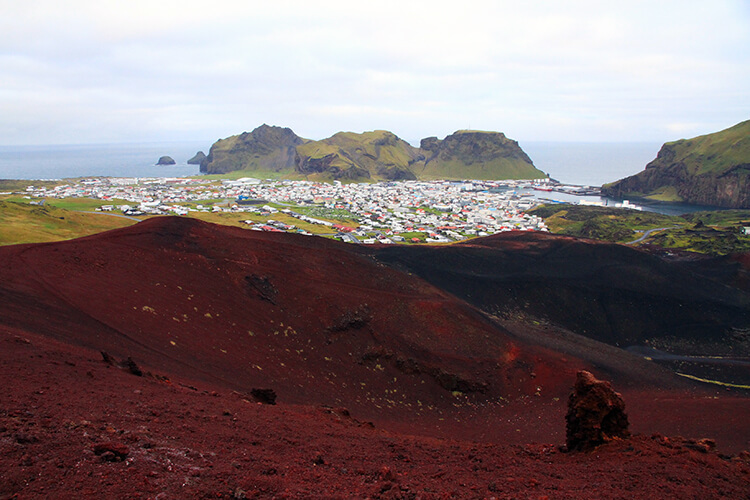 While it is possible to take a day trip to Vestmannaeyjar, it’s definitely worth staying at least one or two nights to explore Iceland’s Westman Islands. 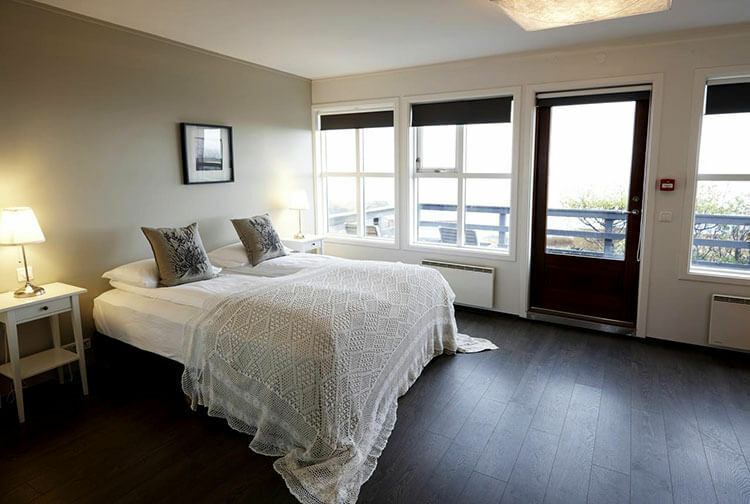 Hotel Vestmannaeyjar (read the TripAdvisor reviews) is located right in the heart of Vestmannaeyjar, with easy access to all that this island has to offer. The rooms are cozy with views of Eldfell, the infamous volcano that nearly covered the main town in 1973 when an violent eruption started unexpectedly in the middle of the night. One of the main activities on the island is to hike to the top of Eldfell. You’ll definitely appreciate Hotel Vestmannaeyjar’s onsite spa with jacuzzi and sauna to soothe your aching legs after trudging up the steep sand and ash volcano. Known for its dramatic landscapes, the Snæfellsnes Peninsula is the peninsula that juts out of the west of Iceland just a bit north of the Reykjanes Peninsula. It’s not part of Iceland’s Ring Road, but it’s worth the detour and adding a few extra days to your trip to explore the glaciers and lava tubes in this region of Iceland. This region gained a bit more fame after much of the filming of The Secret Life of Walter Mitty took place there and visitors sought out inspiring Iceland movie locations from the movie. While you can make a day trip to the Snæfellsnes Peninsula and some tours even offer day trips there, it’s an extremely long day. It’s better to spend at least a night or two in this region of Iceland to properly explore it. An easy drive from Reykjavik, Hotel Hùsafell (read the TripAdvisor reviews) is also a great spot to start exploring the inland part of West Iceland and the beginning of the Snæfellsnes Peninsula. Many Icelanders say that Iceland’s best secrets actually lie inland. One of them that is still relatively off the radar of tourists that beeline for Iceland’s Ring Road is Surtshellir, the longest lava tube in Iceland. You can easily explore it from your base at nearby Hotel Hùsafell. The hotel has 48 rooms in four sizes plus holiday houses perfect for families or a group traveling together. 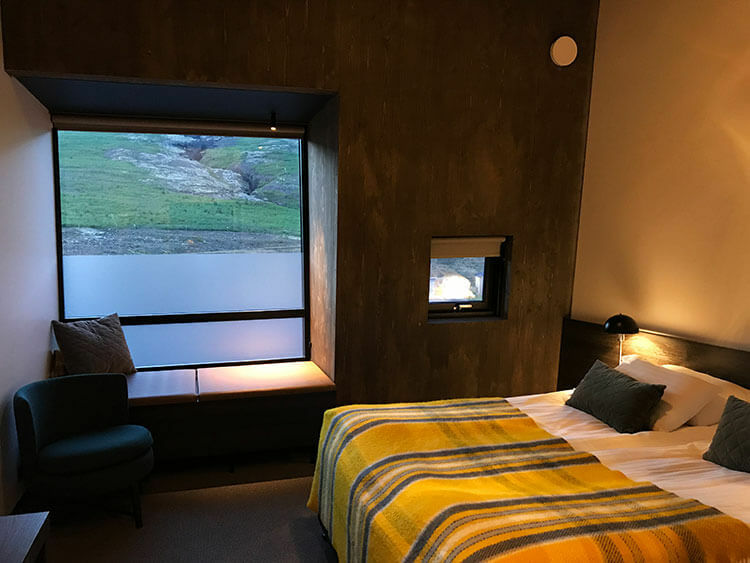 It’s designed so that the rooms give you breathtaking views of the surrounding nature and paintings by the local artist Páll Guðmundsson adorn the interior. You’ll also find toiletries made from local Icelandic herbs in the rooms. Wifi is complimentary throughout the hotel and the breakfast buffet is included. It’s one of the newer and best hotels in Iceland. The geothermal baths are fed naturally and include two pools, a water slide and two hot tubs. There’s also an onsite fine dining restaurant serving local specialties like Icelandic lamb and shellfish soup. 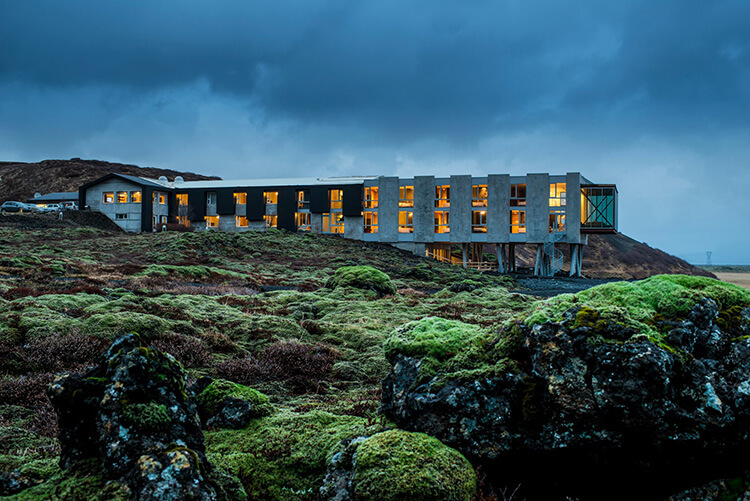 It seems the luxury hotel is in the middle of nowhere and a micro-climate created by the nearby Langjökull glacier often ensures cloudless nights. If you spend three nights at Hotel Hùsafell during the season from September through the beginning of April, you’re almost guaranteed to see the Aurora. That makes Hotel Hùsafell one of the best places to see the Northern Lights in Iceland. 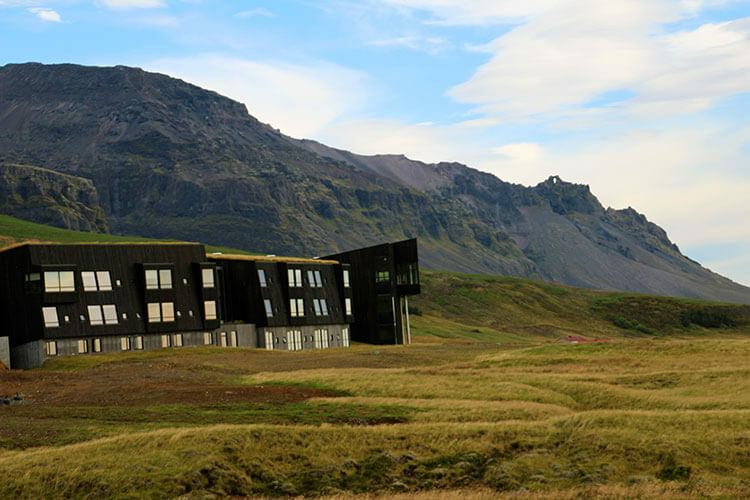 Part of the relatively new Fosshotel chain of hotels that has popped up around Iceland, Fosshotel Hellnar is located right under the Snæfellsjökull Glacier and quite near to the famous Kirkjufell mountain. It’s on the coast where Orcas are often spotted swimming by in the ocean and seals lounge on the rocks, and the Snæfellsjökull Glacier National Park Visitor Center is next door to the hotel. It’s definitely a top choice on the Snæfellsnes Peninsula and often fully booked, so book well in advance of your trip. Unlike Fosshotel Glacier Lagoon, Fosshotel Hellnar has a boutique hotel feel to it and is much smaller and intimate. The rooms are bright and airy with light colors and linens. Some rooms even have balconies with ocean views. Private bathrooms, wifi and modern amenities like flat screen tvs with satellite channels are stand in all of the rooms. The onsite restaurant is also very good and sources local produce for its menu creations. The Westfjords are the least visited and the most remote part of Iceland. 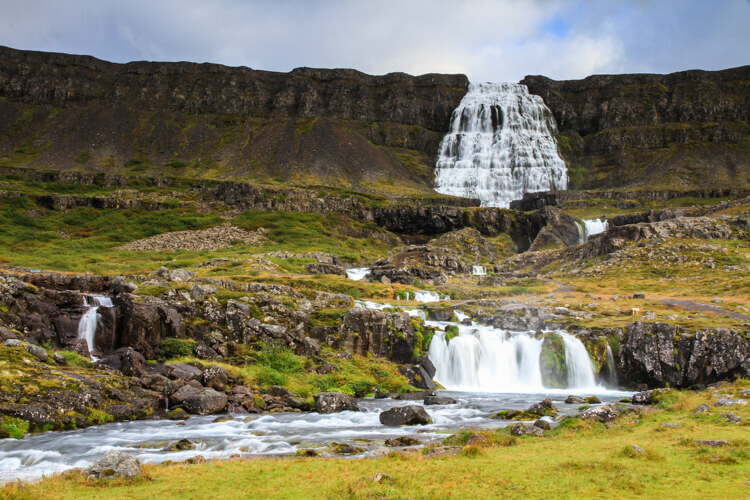 Home to the Látrabjarg cliffs where millions of nesting sea birds like puffins make their temporary home and natural wonders like the multi-tiered Dynjandi waterfall, the Westfjords are really best visited in the summer and early fall. One of our favorite areas to explore by camper van, there are still some family run hotels and guest houses sprinkled throughout the mostly uninhabited Westfjords. Located down a rugged dirt track that you question is even a road you should be driving on, Country Hotel Heydalur is a guesthouse, camp group and restaurant located in the middle of the Westfjords wilderness. The farm has beautiful Icelandic horses, a resident Arctic fox that likes to come say hello to guests and natural hot pots to soak in. There’s 17 rooms total, plus a couple of summer houses with multiple bedrooms that can accommodate up to 10 people, and there’s a campground with showers for camper vans or tent camping. The rooms are simple, but all have private bathrooms and thermal heated floors. The houses are located about 2 kilometers away from the guesthouse, campground and restaurant and all have from 3 – 5 bedrooms plus a living room, full kitchen, bathrooms and terrace. There’s wifi, but it was slow in this remote part of Iceland. 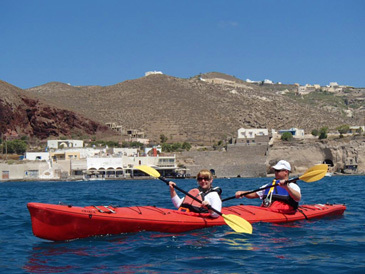 Heydalur can also organize guided horseback riding trips on their horses or sea kayaking nearby. 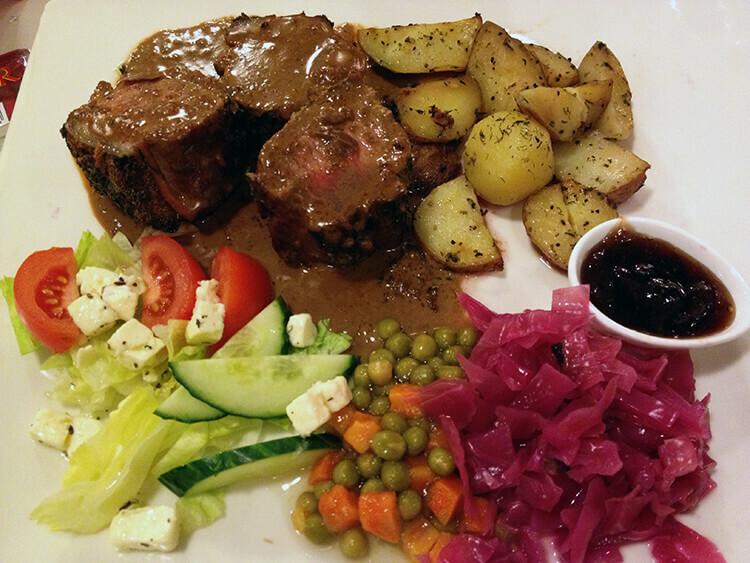 There’s also the onsite restaurant, which is very good with specialties like Icelandic fish soup and lamb. Note that Heydalur can be inaccessible during winter if the road is closed for heavy snowfall and avalanche risk. Ísafjördur is the biggest town in the Westfjords with grocery stores to stock up if you’re traveling by camper van, cute cafes and one of the best restaurants in Iceland. 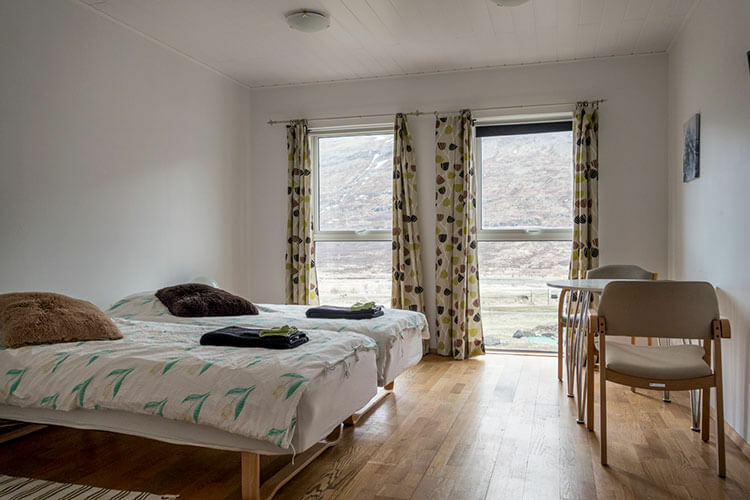 GentleSpace Guest Apartments are all centrally located in Ísafjördur and have made-up bedrooms with linens, bathrooms, modern kitchens, washing machine, wifi and either have a balcony or garden. It’s a family-run business and there are also three guestrooms in the family’s home. The guestrooms have a shared bathroom. Unlike some Westfjords accommodations, GentleSpace Guest Apartments are open year round and the Ísafjördur airport is just a short drive from town if you prefer to fly to the Westfjords instead of road tripping from Reykjavik. Located on a beautiful stretch of beach just 12 kilometers from the Látrabjarg bird cliffs, Breidavík Guesthouse is a great choice for those that want to be surrounded by nature and always dreamed of seeing puffins. The guesthouse has double rooms with a private bathroom, double rooms with a shared bathroom and a hostel-style dorm room. There’s also a campground if you’re traveling by camper van. All guests have breakfast included, wifi and access to washing machines. There’s also an onsite restaurant which is very good serving homemade skyr in the mornings and Icelandic specialties like lamb shanks and locally caught salmon. An alternative to staying in hotels and guesthouses is to combine your transportation and accommodation with a camper van. 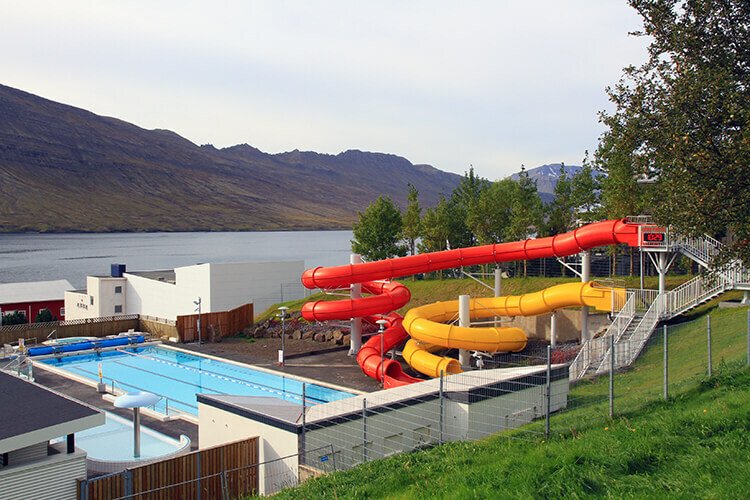 Iceland has campsites all throughout the country offering travelers in camper vans electricity, wifi, bathroom and shower facilities and sometimes even laundry facilities. Iceland is the safest country is the world, and a camper van is one of the coolest places to stay in Iceland because you can nearly anywhere. 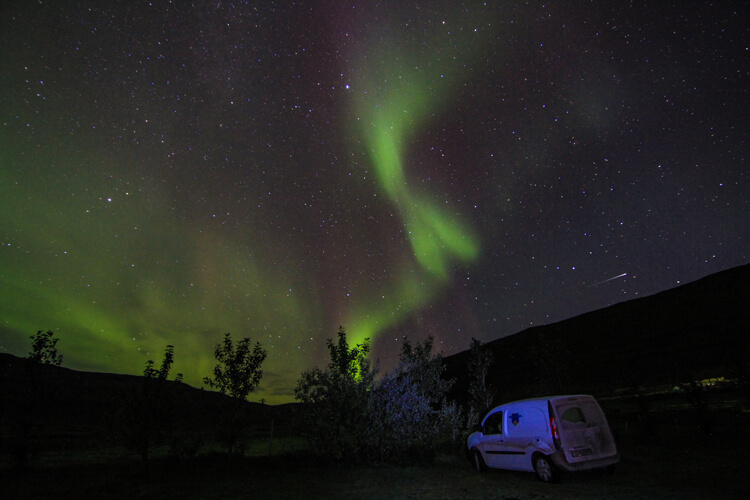 While we wouldn’t recommend a camper van for a winter trip simply because of Iceland’s infamously unpredictable weather, it’s a great alternative during late spring, summer and early fall months. We found the camper van gave us a lot of freedom to explore without needing to reach a booked hotel or guesthouse. It’s also great for photographers looking to get the best light or to capture the often elusive Northern Lights. The class A camper sleeps two adults and we both traveled with spinner suitcases. KúKú Campers also has some larger models that can sleep up to four adults. Just remember that open campfires are illegal throughout Iceland. You’ll want to rent a camp stove or bring one with you and purchase canisters of fuel for it. This article contains affiliate links. When you book on Booking.com or TripAdvisor through our affiliate sites, we earn a small commission at no additional cost to you. The food in these places looks incredible! I’d almost go there just to eat! The food was amazing at both of our farm stays! The restaurants at both are open to the public, so it is possible to eat without staying. I was amazed by this place cos it is beautiful and wonderful indeed! I never thought that there such a place like this in Iceland and it seems great! The food are good as well. Love it! Thanks, Ashley! We ate amazingly well in Iceland and can’t recommend each of these places to stay enough! Whenever we get around to going to Iceland, I might have to be lazy and just follow in your footsteps here. I highly recommend all of the places that we stayed! We actually stayed at the apartment and Hotel Berg on our first trip to Iceland too. And I sure hope to be back to Hali and Vogafjos. Thanks for the writeup on Vogafjos, after dining there last year, I was wondering what their lodging accomodations were like. It’s a unique place. The accommodations are great at Vogafjos. We particularly liked the heated floors and seeing Northern Lights from our door was certainly a bonus! I am trying to arrange a io to Iceland for the beginning of next year. W will only have a few short days and as a photographer I know my husband’s biggest desire is to capture some fantastic shoots of the Northern Lights. I appreciate that this is not always possible but would prefer to choose a place to stay where we have more opportunity to see these rather than just an organised trip. Have you got any suggestions for a short break hotel or accomodation that would not only provide this opportunity but would give us other things to do during the day? Would you recommend car hire? Planning a trip in April! Would love to hear your thoughts on if this is a good time to go or not. I would love to go glacier hiking and am only planning a short trip. Do you think renting a car is a good option? we are thinking about going for a week in early december. I just keep getting nervous that we won’t be able to make it to many places because its winter. What do you think? That said, we love visiting in winter! You have the possibility of Northern Lights and you can still see and do almost everything if you plan for the shorter days and potential weather accordingly. My family & I will be in Iceland from 5th to 8th May 2017. I need help with getting a hotel for 3 pax 1 room in town that is moderate in price, comes with return airport transfer & include breakfast. (we are Muslims from Asia hence international buffet breakfast will help us select safe Halal choices or we can stick to pure vegetarian diet. My sister & me will bring our mom of 70+ along. We have to think of convenienced especially with old folk around. Which hotel or apartment provides such if you may advice please. We are also thinking if it is a good idea to book a hotel within a walking distance to the airport on our 2nd last day in Iceland as we have a flight to board at 7.30am. We do not want to miss the plane as we have trouble waking up too early. I think if you’re looking for a good international style breakfast buffet, the Hilton Reykjavik would be a good choice. Keep in mind that nearly everything in Iceland has to be imported, so there generally isn’t a wide variety. Typical breakfast foods include sykr (a type of strained yogurt), cheese, breads and smoked Arctic char. Icelanders eat a lot of lamb as they are prevalent on Iceland. Beef can be found and a lot of fish, but other meats are harder to find. Especially if you travel out of the capital. You might want to pack some foods that travel well to bring with you to help with your Halal diet. I honestly don’t know much about Halal, so hopefully what I’ve shared about food will help you. Also, if you aren’t early risers you’ll want to stay in Keflavik the night before your flight. 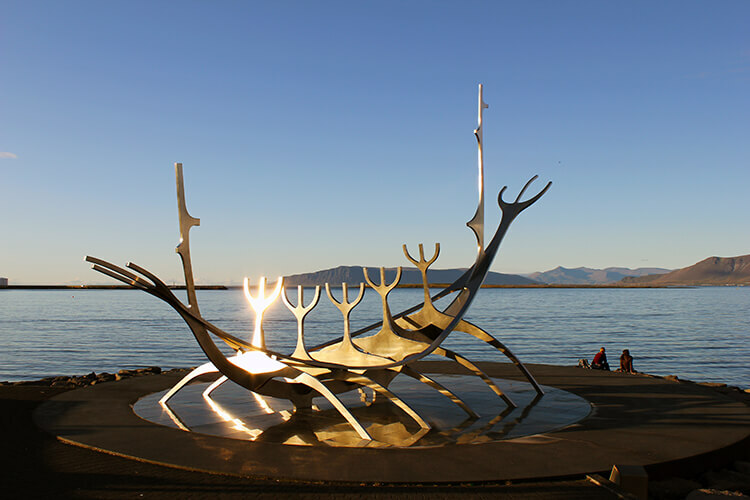 Reykjavik is actually located about 45 minutes drive from the airport, which is in Keflavik. Hello Jennifer and Tim. I love your website and am looking for some advice. We are traveling to Iceland in mid- March for three days and wonder if you could suggest a place to stay for decent food, best northern lights viewing and nature hiking. We could rent a car or not..whatever you suggest. We are three adults and two teenagers. Thanks for your recommendation. March can still be quite snowy. I think your best bet with the time you have is to head to the South Coast. 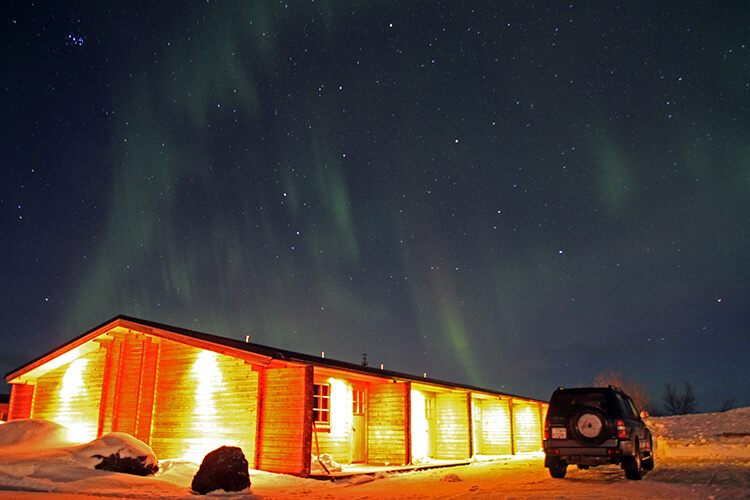 We recommend Hotel Ranga, who has a Northern Lights wake-up call. Nearby, you can do short hikes out to a natural hot pool and to the abandoned DC3 plane crash. We also recommend doing the glacier trekking tour, which is really spectacular. I know very little about Iceland, but find it absolutely beautiful. What are some activities you would recommend? We would like to see the Northern Lights and Blue Lagoon, but other than that have no idea! For Northern Lights, you should plan your trip sometime from September – March. There is so much to do in Iceland, depending on how much time to plan to visit for. We’ve lived in Iceland and traveled extensively there, putting together this itinerary for the Ring Road with things to do: https://luxeadventuretraveler.com/iceland-ring-road-itinerary/ and we also have this Iceland Trip Planner: https://luxeadventuretraveler.com/destinations/iceland-trip-planning/. Feel free to let us know if you have more questions after looking over everything!